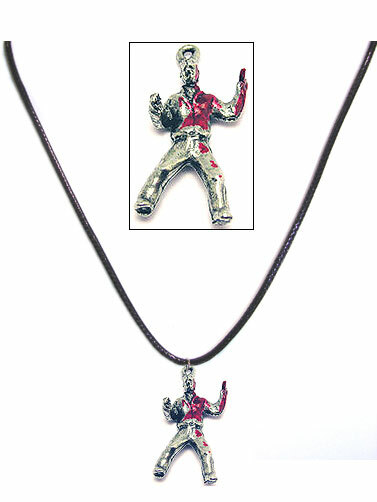 Show your love of slasher films with this unique necklace. Perfect accessory for Halloween and those Horror film fests. Silver killer figure dressed in jeans and a jacket holds a knife in the hand. Pendant has been painted with red enamel for a bloodied look. Bloody Knife Killer pendant measures 1" x .5", and hangs on a 18" black leatherette corded necklace. Necklace features a lobster clasp and an adjustable chain.